Traverse the manifold from from toward to. Returns true if we reached to, and false if we stopped early for any reason, such as a collision or traveling too far. No collision checking is performed if interpolate is true. If geodesic is not nullptr, the sequence of intermediates is saved to it, including a copy of from, as well as the final state, which is a copy of to if we reached to. Caller is responsible for freeing states returned in geodesic. Needs to be implemented by any constrained state space. Like interpolate(...), but interpolates between intermediate states already supplied in stateList from a previous call to discreteGeodesic(..., geodesic). The from and to states are the first and last elements stateList. Returns a pointer to a state in geodesic. A StateSpace that has a Constraint imposed upon it. Underlying space functions are passed to the ambient space, and the constraint is used to inform any manifold related operations. setSpaceInformation() must be called in order for collision checking to be done in tandem with manifold traversal. 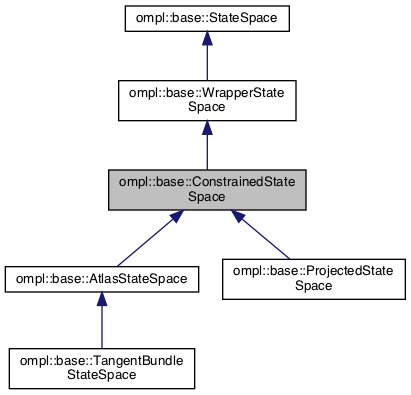 ConstrainedStateSpace encapsulates the idea of decoupled constrained planning, where the planner and constraint satisfaction methodology are separated. Core to this idea is the augmentation of a state space, rather than the augmentation of a planner. In OMPL, this is implemented as the ConstrainedStateSpace and its concrete implementations: ProjectedStateSpace for projection-based constraint satisfaction, AtlasStateSpace for atlas-based manifold approximation, and TangentBundleStateSpace for a lazy atlas-based approach. The core benefit of this method is that there is no additional work to make a sampling-based planner plan with constraints (in this case, a differentiable function of a state, implemented in Constraint), enabling mix-and-matching of planners with constraint methodologies, e.g., KPIECE1 with TangentBundleStateSpace, or RRT* with ProjectedStateSpace, and so on. See Constrained Planning for more details. The following paper describes the idea of decoupled constrained planning, as implemented in OMPL. For more information on constrained sampling-based planning in general, see the following review paper. The sections on projection- and atlas-based planning describe the methods used in the ProjectedStateSpace, AtlasStateSpace, and TangentBundleStateSpace. Definition at line 131 of file ConstrainedStateSpace.h. Check if the constraint's numerical Jacobian approximates its provided Jacobian. Definition at line 136 of file ConstrainedStateSpace.h.